This is the cake I made for my family’s Easter gathering last Sunday. 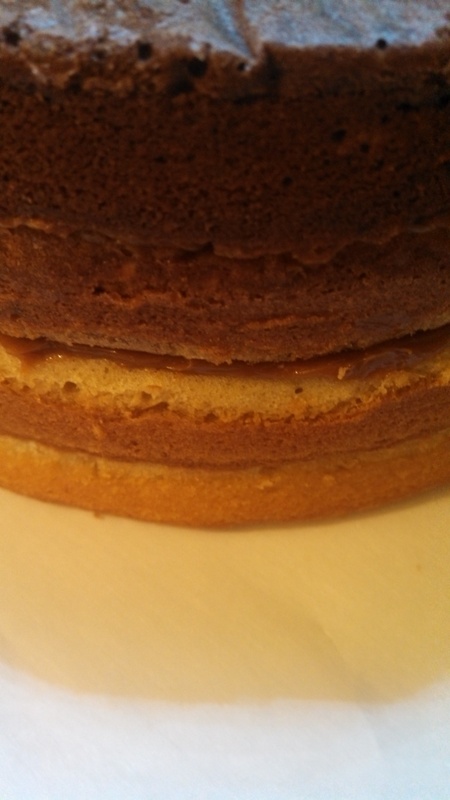 I’d never made such an ambitious cake before. I was done with work early on Friday, around 1:30 and found myself with plenty of time to bake and assemble, thinking everything through twice, since I wouldn’t have time to start over. 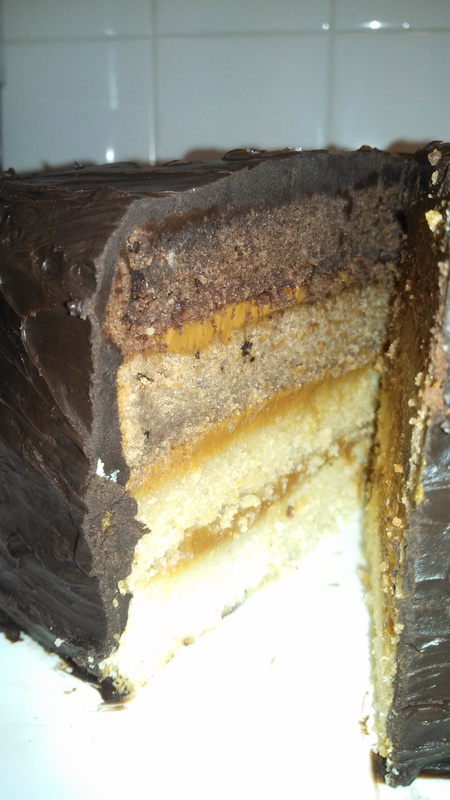 It took me two hours to mix and bake the first two layers, which would end up being layers 1 and 4 in the end product. 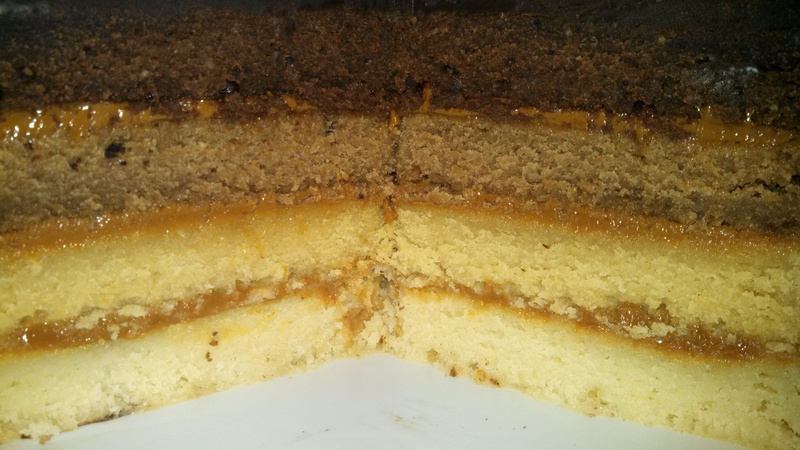 I followed Cook’s Illustrated instructions for mixing it together, since my family hasn’t had much success with white cakes in the past (but then, we hadn’t a stand mixer then either). Feel like I should have prehaps sifted the ground almonds, but the recipe wasn’t very specific with those sorts of details. Also, I maybe should have used granulated sugar instead of raw… to make it more white. Washed up the dishes I’d made up to that point while they baked. Looks good already, right? Let them cool for awhile while I washed the dishes and ate some dinner. 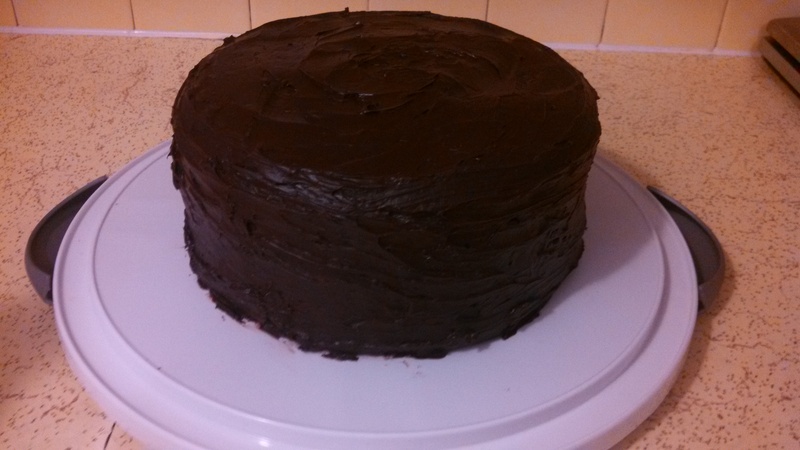 Frosting went smoothly enough, though it took a while for the ganache to cool. 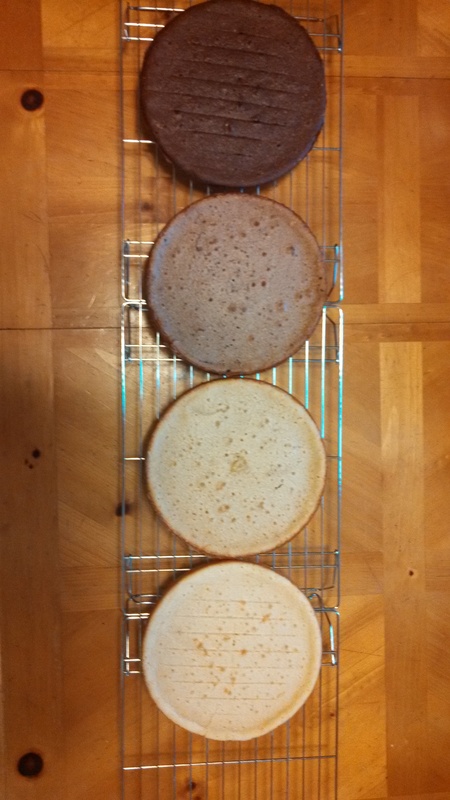 I’d delayed making it, not wanting it to set up too much before the cakes were ready for it. 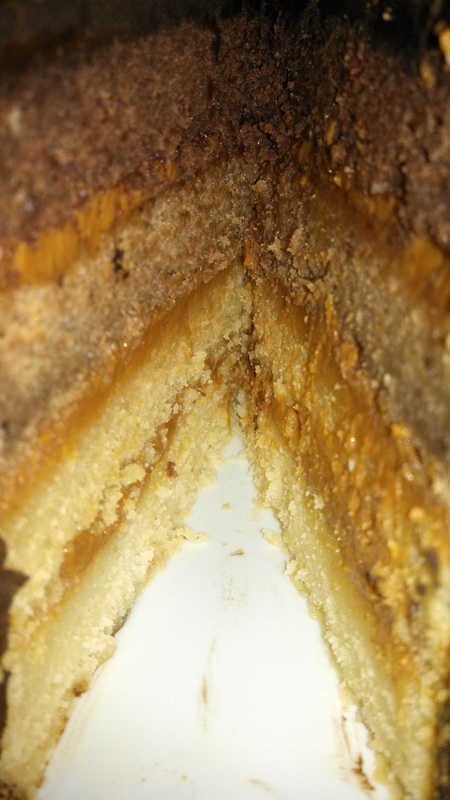 I’d never used canned caramel before and was surprised by how thick it was, but I managed. As you can see from the picture on the left, the gradient layers were working on the outside, at least…. That’s what ‘ombre’ means in this instance, by the way, gradient layers. I’m rather happy with the results and my family seemed to be as well. The two-year old niece said ‘yum’ with every bite and her father had three pieces. 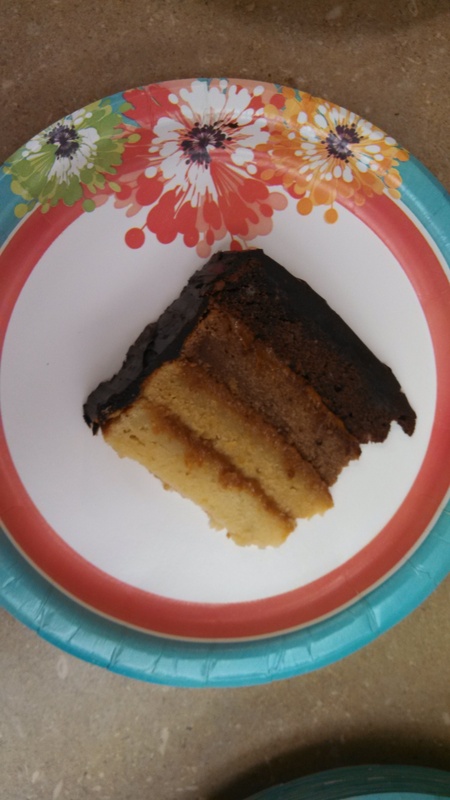 For me, it was moist and rich, but, the texture was a little odd (maybe the almond flour) and it could have had more flavor. Still, the family was happy and I got to stretch my baking skills, so that works for me! This entry was posted in Dessert! and tagged Baking, Cake, Caramel, Chocolate, Easter, Firsts, Ganache. Bookmark the permalink. Thank you. I couldn’t stop taking pictures of it, I was pleased it came out right!